Secure Shell (SSH) is a cryptographic protocol that securely transports data over an unsecured network (see RFC 4253). It allows user authentication through a pair of cryptographic keys. The keys in the pair are called the public and private key. ssh-keygen is a tool from the OpenSSH software, which is used to generate such cryptographic key pairs. In more general terms, keygen refers to the component of any SSH software that has the purpose of generating key pairs for use in an SSH connection (e.g. putty-keygen). 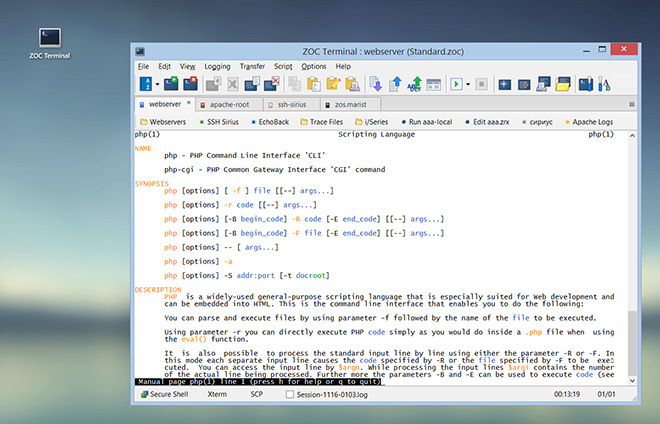 Start your free 30 days of evaluation today and download ZOC Terminal V7.23.3 now. ssh-keygen generates, manages and converts authentication keys for ssh. ssh-keygen can create RSA keys for use by SSH protocol version 1 and RSA, DSA or ECDSA keys for use by SSH protocol version 2. To create DSA key using ZOC's built in key generator, connect to an SSH host and then in the ZOC window choose File-menu > Create SSH Key Files. In the window that opens, choose a bit length (today a minimum of 2048 bits is required to be considered secure), an optional passphrase, a key type and the location and file name to store the key. To create DSA key using ssh-keygen, simply pass -t dsa as an argument. Under Linux the new key will be stored under the ~/.ssh directory with the name id_dsa and id_dsa.pub. Read more about our SSH client ZOC, check its feature list, look at our screenshots or start your free 30 days of evaluation today and download ZOC Terminal V7.23.3 now.